Protests Against Soaring Prices Across Sudan (file photo). Khartoum — Sudanese financial experts have downplayed the effects of the reduction of government expenses as announced by President Omar Al Bashir on Monday. In his address to the nation, the president reported the dissolution of the National Reconciliation Government. The ministries are to be reduced from 31 to 21. The number of ministries in the states will be downsized as well. The reshuffle is part of a major plan to combat the crises in the country by "comprehensive political and economic reforms", he said. According to Al Bashir, the state has developed "an urgent emergency programme that includes specific projects with direct returns, in order to boost performance and achievements in the macro-economic sectors". The new programme is expected "to improve the livelihoods of the Sudanese within a defined time". Professor Hamid Eltigani, Head of the Department of Public Policy and Administration at the American University in Cairo, however ridiculed Al Bashir's economic emergency programme "after nearly 30 years in power". He described the president's new plans as "an attempt to market himself in preparation for the general election in 2020" to Radio Dabanga. "The replacement of mister Ahmed with mister Mohamed can never be a solution to the country's huge economic crisis," he commented. "The structural problems of the country's economy, related to a very weak production sector, the bankrupcy of most factories, a lack of liquidity, and almost no access to loans, should be tackled instead." Hasan Bashir, Professor of Economics at El Nilein University in Khartoum, affirmed the weakness of the plans. "The announced measures are economically limited and will hardly have any impact on the Sudanese markets," he told this station. "The president's decisions are limited to the executive authority, while the executive and legislative branches, and the bodies of the ruling National Congress Party require restructuring as well," he explained. "Reducing the number of ministeries is a good step," the professor added. "The amount allocated to government spending in Sudan is the largest in the world, compared to the Gross Domestic Product." The Sudan Call described "the new measures of the Khartoum regime" as "movements within the society club called government". 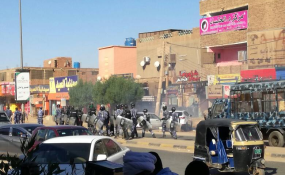 The change "will not resolve the crisis of living for the Sudanese, nor will it bring peace or stability in the country," the Sudanese opposition alliance said in a statement on Tuesday. "It is just an attempt to divert the attention [..] from Al Bashir's grip and the grip of his family on [..] the country's resources." On Saturday, the Sudanese government announced the formulation of a roadmap for the implementation of economic, financial, banking and commercial agreements signed with Turkey, concerning gas, oil, minerals, agriculture, and livestock projects. Earlier this week, the Turkish Deputy Economy Minister arrived in Khartoum accompanied by a delegation of 40 Turkish businessmen, Sudan Tribune reported on Tuesday. The South Sudanese Minister of Oil recently announced that will soon pay the country's outstanding oil debt of $1.2 billion to Sudan. On September 3, Radio Dabanga reported that China will grant Sudan $58 million and an interest-free loan of $30 million.